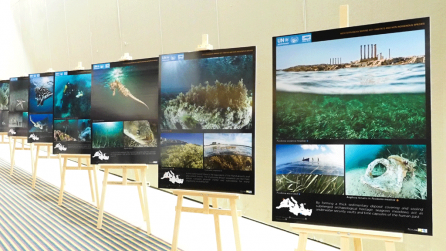 A photographic exhibition on Mediterranean marine habitats and non-undigenous species is being held on the occasion of the “Marine key habitats and NIS symposia”, offering the visitors the opportunity to enjoy the wonderful Mediterranean underwater world. The Specially Protected Areas Regional Activity Centre (SPA/RAC) is organizing the Mediterranean symposia on marine key habitats and non-indigenous species, in collaboration with the Turkish Ministry of Environment and Urbanisation and the Turkish Marine Research Foundation (TUDAV). On this occasion, a photographic exhibition is being held at the conference venue from 14 to 17 February 2019. 26 panels are displayed, offering a glimpse into a world full of beauty and secrets and presenting marine landscapes made up of marine vegetation meadows, corals, dark habitats like caves, as well as non-indigenous species in the Mediterranean Sea. The pictures were taken by Mathieu FOULQUIÉ and Renaud DUPUY DE LA GRANDRIVE, two naturalists, marine biologists, divers and photographers, passionate about marine environment. Mathieu and Renaud have a longstanding collaboration with SPA/RAC. They took advantage of their participation to field missions organized by SPA/RAC in many Mediterranean countries to take these wonderful pictures from the Mediterranean. The exhibition also contain two panels produced by TUDAV and featuring some non-indigenous species in Turkey. The aim of this exhibition is to inform and raise awareness among the general public and decision-makers about the importance of the marine ecosystems and biodiversity. In the living world, everything is connected and life under the sea brings life to us. Hence, the better we conserve marine species, the habitats where they live and the links among them, the better we preserve our quality of life. This exhibition is produced by SPA/RAC within its mission to assist Mediterranean countries in implementing the Barcelona Convention SPA/BD protocol, and more specifically to: (1) protect, preserve and manage in a sustainable and environmentally sound way areas of particular natural or cultural value notably by the establishment of specially protected areas; and (2) protect, preserve and manage threatened or endangered species of flora and fauna. Held for the first time in Antalya, this travelling exhibition will be presented in the coming months in other Mediterranean countries, such as Lebanon and Tunisia, in the framework of the implementation of SPA/RAC projects and programmes.